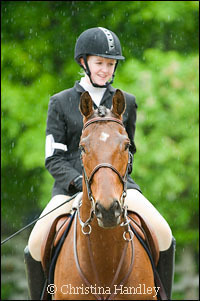 After a long Canadian winter, I am always looking forward to the first outdoor horse competitions. 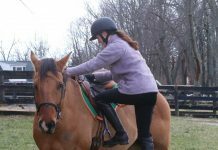 Along with the warmer weather, springtime horse shows usually mean we could be dealing with rain and mud. Taking pictures in the rain can be frustrating and difficult but not impossible and when approached with the right frame of mind, it can actually be quite rewarding. Shooting in the rain probably means slow shutter speeds because it’s dark out. This is where we can get creative and have fun, try panning! Panning is simply following your subject with your camera as they cross the frame in front of you using a slow shutter speed. Panning does not work if they are moving towards you or away from you. The best angle for panning shots is to start shooting when they are at about a 45 degree angle to your left all the way through to about a 45 degree angle to your right. The absolute best time is when they are passing directly in front of you. 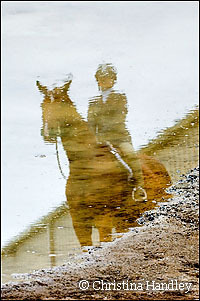 Here is a panning shot I took at a rainy day horse show, cool right? It blurs and streaks the background which adds impact and implies movement to the photo. I shoot them while jumping or on the flat. Don’t forget to use a slow shutter speed for this. Try starting with 1/60th, 1/30th or 1/15th and see what you like. Knowing the exact shutter speed to use will take practice as it depends on a number of things. A few things to consider are the focal length of your lens, how fast the horse is moving and how far away from you the horse is. Candid shots in the rain are fun too and there are a barrel of them to be taken if you sit back and watch. Some great places for candid photos are near the in gate or warm-up areas etc. Any place there is lots of activity is good. And I try to focus on the small stuff like textures and details. I love to study bits and pieces of things looking for anything that grabs my attention like details on tack, patterns in horse hair, reflections in mud puddles or hoof prints in the mud. So, if you are out there taking photos in the rain try some new stuff and enjoy! Wow – GREAT article! Thanks for the inspiration and tips. I really like looking at the pictures on this blog. You do such a good job! Hope to see more entries soon. 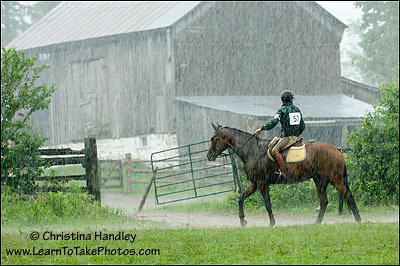 I am a photographer my self and I have always woundered how to take pictures of my horses in the rain when they are moving. I am so glad you posted something like this. you are my all time favorite photographer and I look up to you. i would love to become a photographer some day. 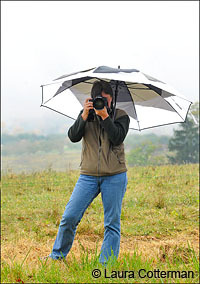 i love reading your blogs!i especially like the rain photos!!!! my fav is the cowboy hat in teh mud :^). this was a very helpful article! thank you so much for posting it! i really love your work.